Information about the individual members of the Cinical faculty of the Department of Orthopaedic Surgery. Orthopaedic nursing is a nursing specialty that focuses on the treatment of musculoskeletal disorders. These range from acute fractures to joint replacement subsequent to chronic damage. This services focuses on resconstructive hand surgery, acute trauma and rheumatoid disease. This services focuses on hip and knee arthritis and hip and knee reconstructive surgery. This service addresses degenerative and traumatic diseases of the neck and lower back. This services focuses on shoulder and elbow problems and the diagnosis and management of sporting injuries. This service focuses on pelvic and acetabular trauma, high energy/multi-trauma and geriatric trauma. 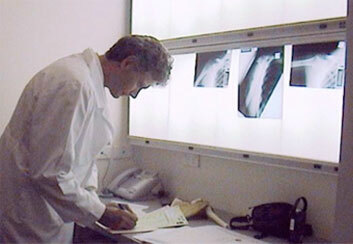 Professor Murrell reviews a patient's x-ray.